"Make a crumb pie shell (see below) in a glass serving dish. Beat 6 egg yolks until light, and add 1 scant cup sugar. "Soak 1 envelope of gelatin in 1/2 cup cold water. Put gelatin and water over a low flame, bring to a boil, and pour it over the sugar and egg mixture, stirring briskly. "Flavor with 1/2 cup dark rum (Jamaica). Cool this until the mixture beings to set, then pour it into the pie shell. Chill until firm. "Sprinkle top of pie generously with shaved bittersweet chocolate curls. Garnish with shipped cream. Serve cold." "Crumb a 6 oz. package of Zwieback. Blend 2 tbspns sugar, 1/2 tspn cinnamon, and 1/2 cup soft butter with the Zwieback and mix well. Press this mixture evenly into the 10-inch glass serving dish." 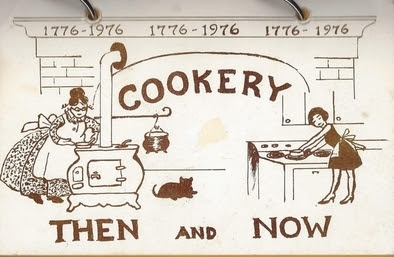 "This recipe is a favorite dessert at the Campbell's Tavern at Williamsburg, Virginia." Per the Colonial Williamsburg Foundation, "Noted as George Washington's favorite for seafood, Christiana Campbell's Tavern is as alive today with conversation and political discussion as it was in the times of the founders. Menu items feature crab, shrimp, fish, and scallops - all items that were familiar to 18th-century Virginians."